A basic tenet of having a positive relationship with your dog is to ensure that you are not leading by force or creating fear. 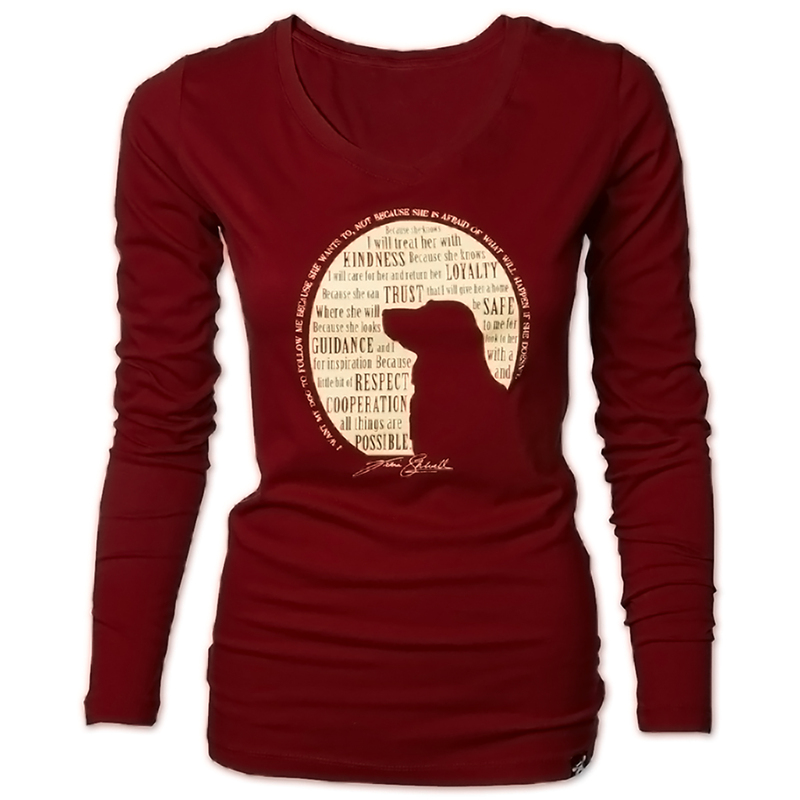 This lipstick colored, v-neck, long-sleeve tee is the perfect Fall apparel item. Made of 100% pima cotton this vintage-feeling, tissue tee is pre-shrunk, but will stretch out a bit during the day as you wear it, returning back to its normal silhouette with washing. Materials: 3.2 oz. 100% lightweight Pima cotton. Pre-laundered to eliminate shrinkage. Fit: Designed to be a "Fitted" tee featuring longer length. For looser fit size up one. Care: Machine-wash warm with like colors. No bleach. Tumble dry low. Very nice shirt. Did not launder yet, but think I will hang to dry, because it does run small. The fabric is thin, so probably good for fall weather, but will need an additional layer in the winter. The saying is why I purchased, along with the long sleeves (extra long) and V neck. Well naturally I love the quote on the shirt and I love the color but it runs very small. After being in it for a while the shirt will stretch out width wise but I am 6 feet tall and have a long torso and the shirt just barely goes to the top of my pants. I have thought of ordering a larger size but am concerned, considering the price of the shirt, that a larger shirt my just get wider, rather than longer and I still wont be able to wear it. Beautiful shirt, get compliments all the time.